Human remains from a cave in northern Spain show evidence of a lethal attack 430,000 years ago, a study has shown. Researchers examined one skull from a site called the Pit of Bones, which contains the remains of at least 28 people. They concluded that two fractures on that skull were likely to have been caused by "multiple blows" and imply "an intention to kill". 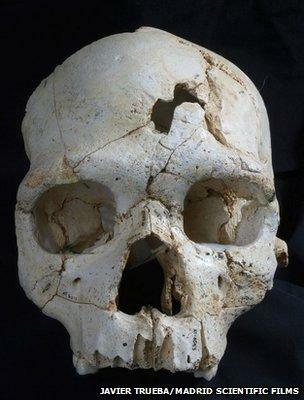 As well as providing a clue as to why the bodies were in the cave, scientists say the study provides grisly evidence that violence is an intrinsic part of the earliest human culture. 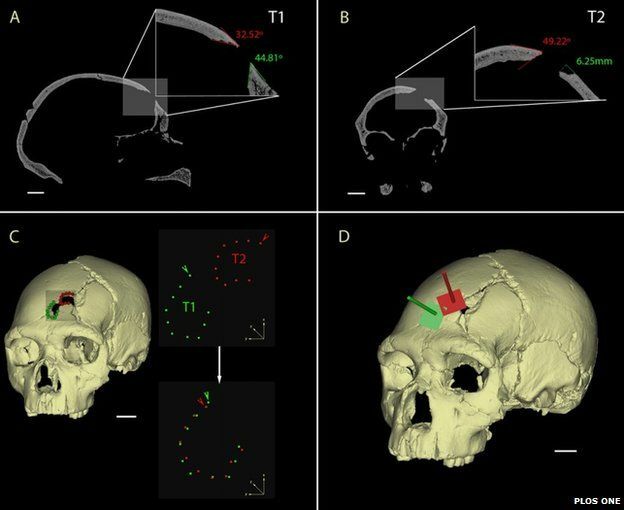 The international research team studied the skull - cranium 17 - using modern medical imaging techniques. Their virtual reconstruction showed that two clearly visible fractures on its front were almost identical, strongly suggesting, "that both were caused by the same object". This forensic investigation provides a piece in the puzzle of how these people came to be in the cave, which is known in Spanish as Sima de los Huesos. The site has been studied by scientists for more than three decades. In 2013, researchers were able to extract ancient DNA from one of its preserved bones, leading some experts to suggest that the bodies inside were early representatives of the Neanderthal lineage. The site continues to be a hot topic for researchers trying to unravel the increasingly complicated story of human origins. And while this study does not tackle that scientific debate, it suggests that the long vertical shaft of this cave was a place where these ancient people deliberately "deposited deceased members of their social groups". The researchers conclude in their paper that this may have been "a social practice among this group", and may even be "the earliest funerary behaviour in the human fossil record". Professor Debra Martin is an anthropologist from the University of Nevada, who studies ancient human cultures, including evidence of violence. She told BBC News that she found the researchers' conclusions "completely compelling". Prof Martin added: "I suspect the farther we push back and find straight up forensic evidence such as these authors have, we will find that violence is culturally mediated and has been with us as long as culture itself has been with us."